Archaeologists exploring the ocean depths just off the coast of Oahu have discovered, intact, the sunken vessel that carried out a gripping rescue mission on December 7, 1941 — sailing into Pearl Harbor as the infamous attack unfolded, carrying British evacuees to safety — all with a Japanese submarine close on its tail. Researchers from the University of Hawai’i and NOAA’s Office of National Marine Sanctuaries made the find while surveying waters about 32 kilometers off the coast, using sonar equipment and three-person submersibles. The ship, originally built as the C.S. Dickenson and later commissioned as the U.S.S. Kailua, was in “remarkable” condition, the archaeologists said. “Seeing the ship come into view, we were all amazed at its level of preservation — and by the fact that everything was more or less in place,” said Dr. James Delgado, director of NOAA’s Maritime Heritage Program, in a statement. Launched in 1923 for the Commercial Pacific Cable Company, the Dickenson spent most of its years taking part in the gargantuan feat of engineering that linked the islands of the Pacific by underwater communications cable, making repairs and ferrying equipment to stations on distant atolls like Midway and Fanning Island. With the advent of war in the Pacific, the Dickenson was chartered by the U.S. Navy in May 1942 and re-commissioned as the Kailua IX-71. 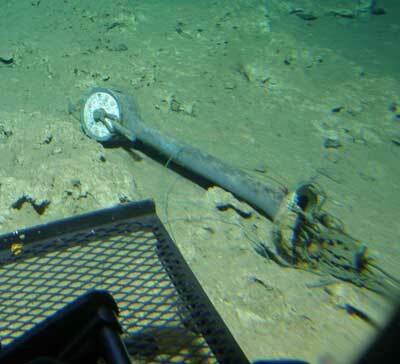 It was put to work laying cables and maintaining anti-submarine nets in New Guinea and Oahu. The Kailua survived the war without damage, only to be decommissioned in the fall of 1945 and then intentionally sunk, as a target in a torpedo range, in February 1946. 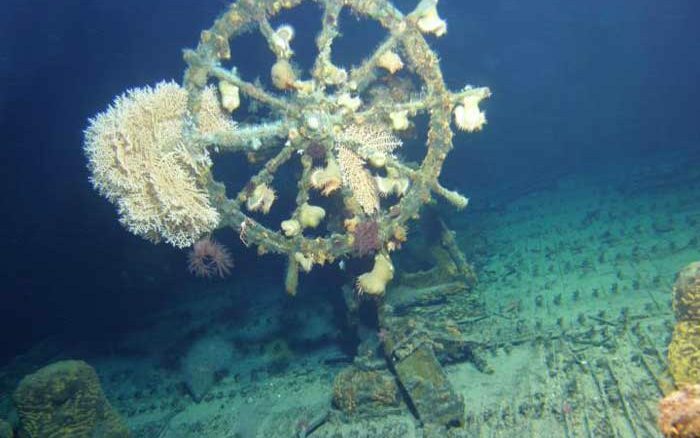 “One of our first views of the USS Kailua was the classic helms wheel on the fantail,” said Hawaii’s Terry Kerby, who piloted the submersible that made the find. Despite its long war service, it was the emergency rescue mission that the Dickenson conducted in December 1941 that gained fame for the vessel. As tensions mounted all around the Pacific, British officials began to fear for the safety of civilian workers who staffed the communications station at Fanning Island, now known as Tabuaeran. 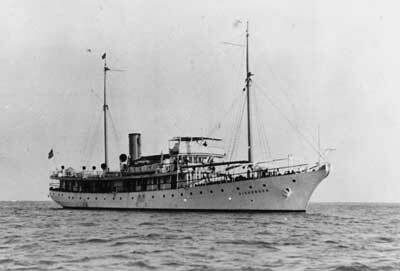 Though just a private communications ship, the Dickenson was chartered to collect the evacuees and take them to Hawaii. On Dec. 7, 1941, it sailed into Pearl Harbor as the attack began, and evacuees on deck reported seeing a Japanese “midget submarine” tailing the ship as it neared the port, before U.S. ships ran it off. The Commercial Pacific Cable Company’s cable-laying ship Dickenson, built in 1923. Nari Strange, a Briton whose family was aboard the ship, recalled: “The crew and passengers on the Dickenson were watching the events, wondering if the U.S. Air Force was being too enthusiastic in their bombing practices, and they were quite annoyed initially. were abandoned in order to get the crew and passengers safely ashore. Dr. Hans Van Tilburg of the National Maritime Heritage Program said the vessel’s service before, during, and after the war make it a uniquely important artifact from the early 20th century. “From her interisland service to her role in Pacific communications and then World War II, Dickenson today is like a museum exhibit resting in the darkness, reminding us of these specific elements of Pacific history,” he said. 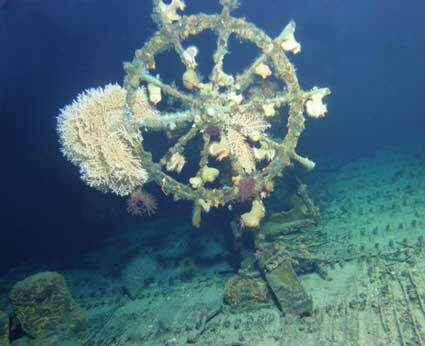 “We plan to nominate the wreck to the National Register of Historic Places,” Delgado said.